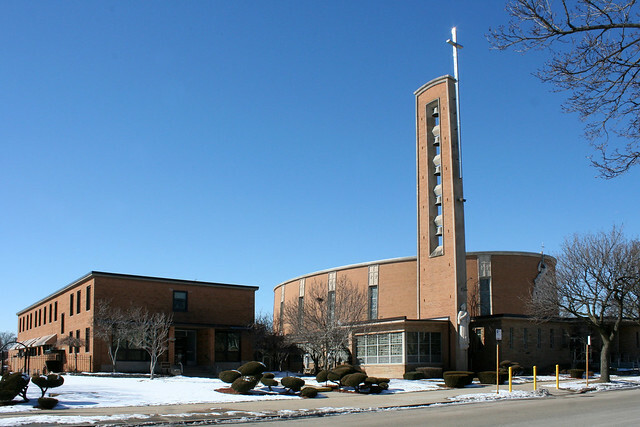 St. Thomas More Church sits on S. California Avenue at 81st Street, amid vast stretches of post-World War II semi-suburban cityscape. Founded in 1947, it was the first new parish established in the city after the war, and is older than most of the development around it. The far south side of Chicago boomed in the post-war years as new, modern houses went up, and the parish’s growth was rapid. 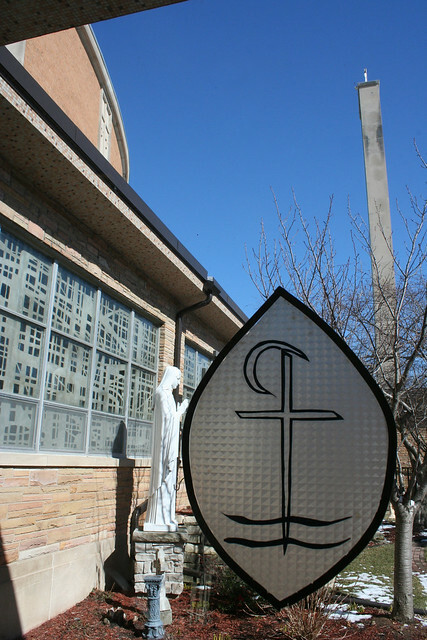 St. Thomas More began holding services in a 300-seat temporary building a few blocks east, at Talman and 81st Street. Meanwhile, a series of buildings went up on the larger site on California Ave., beginning with the school, followed by the convent, the main church building, and a rectory. The parochial elementary school leapt from an enrollment of 250 to 450 in a single year. In 1950 a second story was added to the school building, bringing its student capacity to 800. In the following decade, even that would not be enough, and students would be split between morning and afternoon shifts. A second addition of 8 classrooms followed in 1954, designed by architects Barry and Kay; this building sits on the south border of the property. At its peak, the parish school had 2,000 students. Enrollment fell over the following decades, leading to the school’s closure in 2005. Today the building houses a charter school. The convent, seen to the left of the church above, was built in 1954 with housing for 21 residents. All these buildings were designed by Chicago architecture firm Barry and Kay. The firm’s principal was Gerald Ward Barry Jr. (1924-2005). 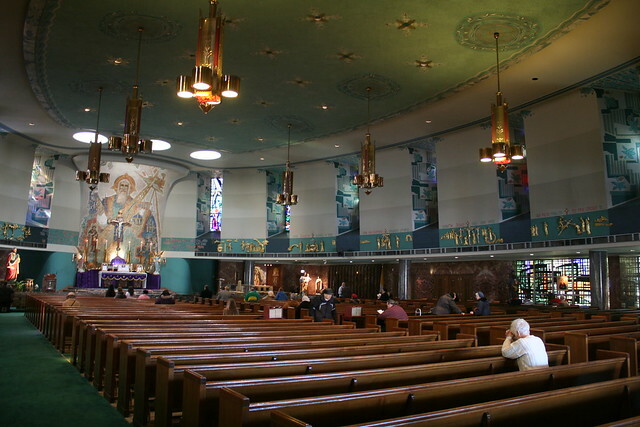 Presumably aided by his prominent family connections (his relatives founded Barry University in Florida; his father, Gerald Barry senior, was also a local church architect), Barry & Kay designed many Catholic churches and school in Chicago and around the country. Other works by the firm include the magnificent St. Ferdinand Church on the far west side and Chicago’s St. Cajetan Church, also on the deep south side. Planning for the new church building began in 1956, to replace the temporary structure at Talman Street. The cornerstone was laid in November, 1957, and the new building was dedicated at the end of 1958. 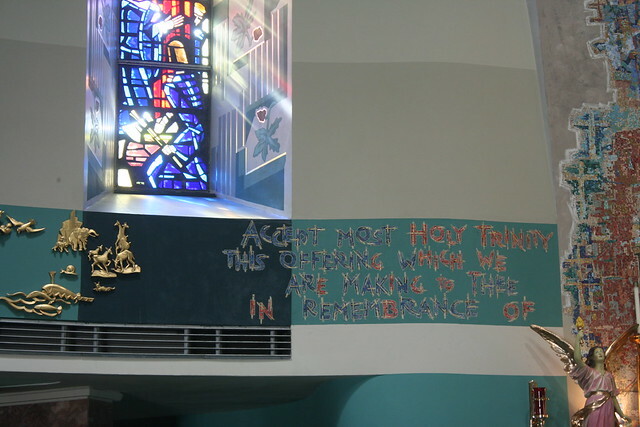 Described as “ultra-modernistic”, the new sanctuary seated 1,300, was fully air conditioned, and included a large chapel in the basement. 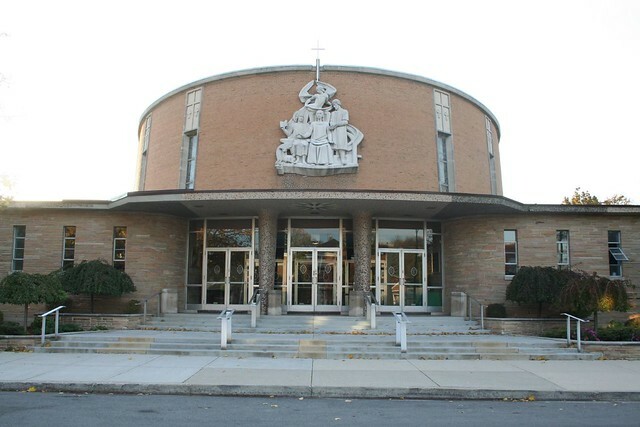 St. Thomas More’s main building consists of an oval drum sitting atop a one-story rectangular base. The base contains chapels, side wings, the lobby, stairs, entrances and other assorted service spaces. The drum, of course, is the main sanctuary space, distinctly articulated inside and out. Flagstone and harmoniously colored 1×1 tile cover the ground level facade, with orange brick above. 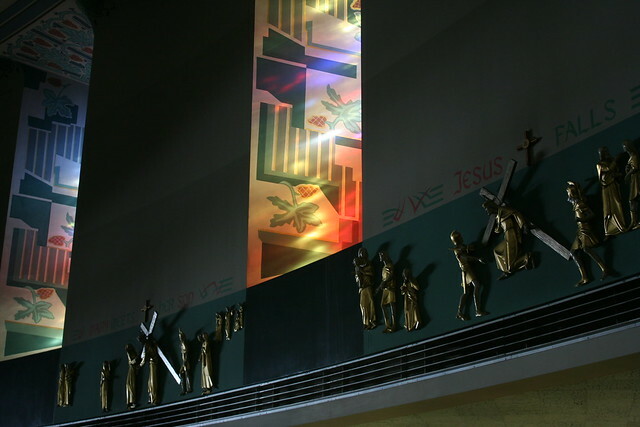 A high-relief sculpture group centered on the church’s namesake saint marks the entryway. Inside, the sanctuary is simple in form, with a flat ceiling and no columns in the primary space – but elaborate in ornament. Tile mosaics enliven the walls with images and delightfully stylized text, and the hanging lamps are a 1950s delight. 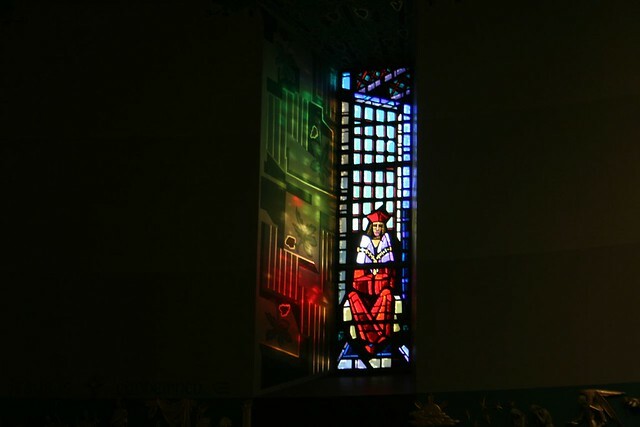 The deeply recessed stained glass windows are made of faceted glass, designed by Gabriel Loire (1904-1996) of Chartes, France; they portray the life of Thomas More, recognizable by his peaked cap. 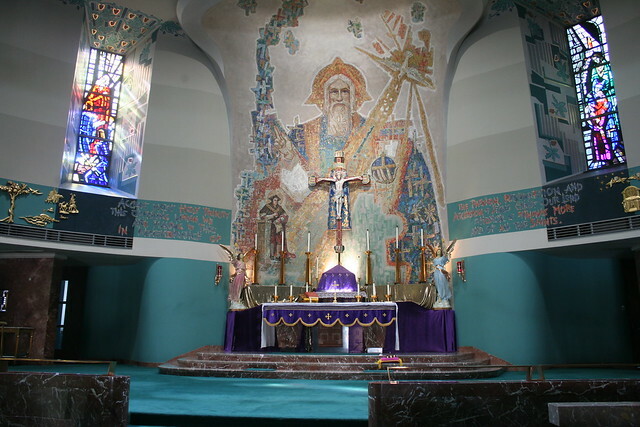 The reredos is a curvaceous affair, rising up behind the altar and swelling up to the heavens, covered with a massive tile mosaic and lit from above by three circular skylights. I am particularly fond of the designs on the window recesses, a melding of abstract shapes and symbolic imagery, and the aggressively whimsical font used on the text. 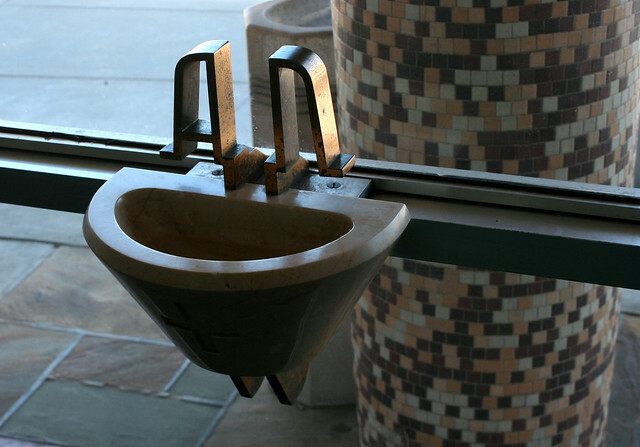 Plenty of little period details enliven the rest of the building, as well, such as the holy water basin in the lobby. 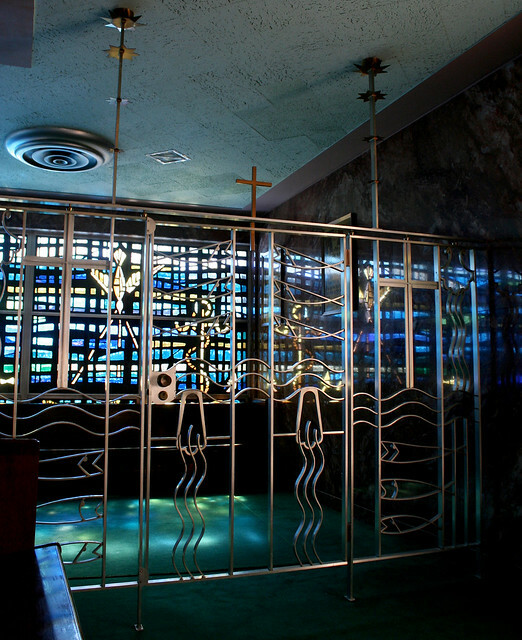 The baptistry gates are another high point, loaded with abstracted imagery. 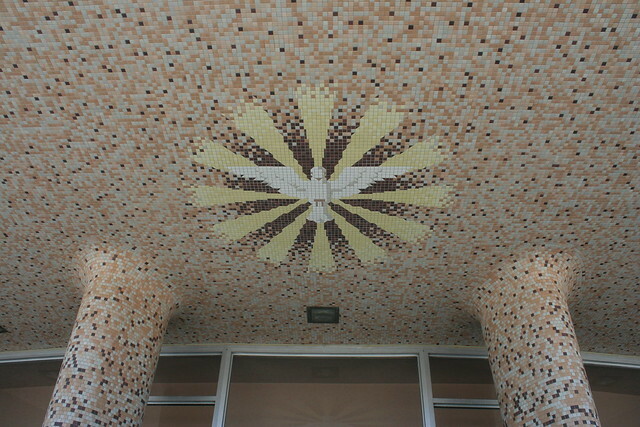 A tiled holy dove is emblazoned on the ceiling of the entry canopy, whose tapered columns dissolve seamlessly into the ceiling. 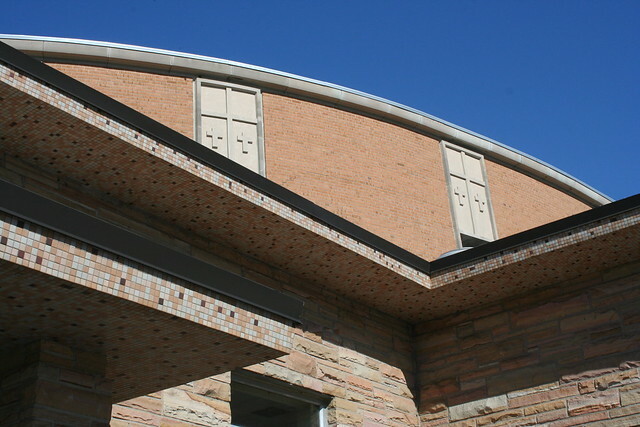 The same tile pattern carries all the way around the building’s exterior. During one visit I was gently greeted by an aged priest; during another, two older women were raptly offering alternating Hail Marys in the sanctuary. I did not visit during services and so have no notions about the congregation’s size or health, though the school closing obviously speaks to changing local demographics – likely a home-owning population that’s aging in place while their children have moved elsewhere. 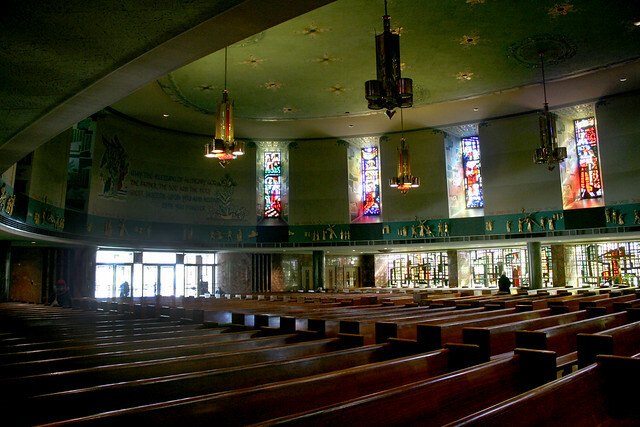 Regardless, the church building and its harmonious ancillary buildings are one of the area’s best Mid-Century religious complexes, intact and well-maintained to this day. This entry was posted in Midcentury churches, Mosaic Tile, South City. Bookmark the permalink. I just can’t get my fill of tiny tiles! @Luke Breckon: I know, right? They add such a wonderful layer of micro-detail. Really enjoying your comments as you work your way through the blog, BTW. Glad you’re enjoying it. OMG I grew up in “Tommy More” and spent the 1950’s and 60’s there. I remember as a kid some of the “old” people, (of which, now I am one of) stating the new church didn’t look like a church but a missile launcher. Your photos and commentary are fantastic! I’m a writer and stumbled across this while researching Catholic school closings. (I too have a word press blog .) Your photos are stunning and I’m making my way through your posts. The three flat pix really bring back memories. So glad I found your blog! I feel blessed to have grown up there. What a beautiful church and community. You should see it at Christmas. best years of my life growing up in Tommy More…..still meeting people who lived there also many many years ago. I graduated in ’73….yes I just dated my myself. I wish we could have another reunion like we did years ago. Such a good time to see “old” friends. Have mixed emotions. Great Parish, wonderful community at one time. My wife grew up in the area, and attended STM along with her brothers, and sisters. We were Married at STM and bought our house shortly there after. My 4 children all graduated from STM, and still have friends they have known since 1st grade. The church, and the homes were bought and paid for by returning vets from WWII. The neighborhood was safe, and families looked out for each other .Folks in this parish were of many professions. There were a lot of Doctors, Lawyers, Politicians, Police, Fire, and reps. from all trades. It was a great melting pot of Wealthy, Middle Class, and Poor, but all had one thing in common that kept them as one and that was STM. As time went on the neighborhood tried to welcome new residents who began to move into the parish in the late 80’s,and early 90’s. The people of the parish attempted to stem the tide of white flight and welcome the new residents who were not Catholic, because they loved the area and the parish. Then it started. The ideal safe neighborhood began to die. Robberies, Burglaries, Auto Theft, and Hookers walking Western Ave. It was hard for the sons, and daughters of these WWII vets to stay, and soon it became a safety issue. It all fell apart on a warm day when a WWII vet attempted to stop one of the new residents from robbing him near his home on Francisco.. He was shot, and killed. I was there. The thug who killed him had recently moved into the 86th, and Washtenaw area. The homes were all sizes, but it was a community, and the new residents took away this feeling of safety, and community. Today I am in my mid 60’s a baby boomer, and not only fighting the aging process, but trying to keep the memories of a great time in my life watching my children grow up in that wonderful community. So I do have mixed emotions. I still drive through the Parish, and get emotional when I remember what it was like when we lived there. I try to be Christian, but when I look at that beautiful church, and the homes that were filled with safety, and family .I try not to hate the new residents. They have taken so much from us all. I hope I don’t go to hell!! Wow…Jim said everything I was just thinking…I am a Tommy More gal thru and thru….honored to be a part of a great parish…..the ties the parishioners had with each other r still strong today, even if we don’t live in the same neighborhood …we r one big family….loved our school, our priests, our nuns and of course our beautiful one of a kind church where many many memories were made……our church, because if u grew up in Tommy More u still considered it “our church” , was a gathering place which always brought us back together to pray, laugh, cry, or just reunite……which was evident at the large number of parishioners who came back for the amazing all schools reunion of. 2007, to either listen to Father Brankin’s unforgettable homily, or to gather in the church parking lot to reminisce about the “good old days” and be around “family”…..If you are from Tommy More you know it is a special honor to be a part of this closeknit family, where the beautiful glass doors on California ave will ALWAYS welcome us back home!!! , but 2000 miles apart. Met in 2003. Howzat!!!! My church growing up. Lovely photos brought back many memories. My sister went to school there,graduated in the church. I mad my communion there, and my Grandmother had her funeral mass there. My dad just recently moved out,8th and francisco. I miss stm and the neighborhood badly! Live in cajetan now,while nice, it’s no Tommy more!! Hope my 3 kids have the same upbringing I did and friends I did from cajetan that I did from Tommy more! Fr. Branken was awesome and very patient with us! Too bad the great white flight happened,it really didn’t need to. What a great neighborhood ! Everyone worked so very hard for their homes , the church, and their kids .I do not think I will ever experience the like again. The feeling of closeness and safety. It was a collective consciousness of some kind. I try not to think of the kind of people who have since moved there. It turns my stomach… But,I will always have the memories of growing up in the best parish in the city . I was one of the first children who was baptized at the original “quonset hut”, temporary church on 81st and Talman. I went to all 8 grades, at St. Thomas More School, as did half of my 8 brothers and sisters. It broke our hearts to have to leave the neighborhood in 1968, soon after our mother died. I guess our dad thought that the neighborhood would soon be threatened by the changes that continued from the east, that invariably traveled west, block by block. It was such a shame that it had to happen. I miss the old neighborhood, and my old parish, and have been invited back to many Class of ’61 reunions that began with a Mass at our old church. At 68 years old, frankly, I am terrified to go there, and park my car in the parking lot, in order to go to Mass. I am disabled, and walk with a walker, so in my mind, I would be a prime target for anyone, to knock down, beat up, and rob. The neighborhood is no longer that safe haven, but a haven for thugs and criminals. One can look on the Chicago Police website to check to see what sorts of crimes are committed there, everyday. They have overtaken my neighborhood, its parish, and community, but they will never take all the wonderful memories of friends, and the families, who were the foundation of our beautiful church. Thank you so much for the pictures and the wonderful article. I have so many wonderful memories here. I loved the Trinity mosaic and used to think that God the Father was looking directly at me, regardless of where I sat in the church. We had a 9:00 a.m. children’s mass on Sunday and our parents would be in the chapel in the lower level. I recall Stations of the Cross and those marvelous gold gilt Station figurines. I recall the school getting an addition; at first it was only one level. When I was in 6th grade, they added on another two or three floors – we had half day sessions that year and I had the afternoon one. My sister said she recalled a cafeteria there but there was none during my years there. During Lent, we would attend mass in the morning and we’d be allowed to bring our breakfast to the lower level of the main building. That’s the only time we could eat there. Otherwise we had to hoof it back home. For me that was all the way to 80th and Maplewood. My family moved from the area back in 1964, but we held my parents’ funerals from there. I’m glad to see that the Church still looks great. Thank you for sharing your photos! It is so nice to read all the above comments and the memories by those who are a part of the STM family. I came from a family of six kids, who moved into STM in 1967. We all went through STM and then on to Mother McAuley and Brother Rice. I was married by Fr. Brankin in 1986. Sadly, my parents had no choice but to move out in 1993 and it was that shooting (that mentioned in an early comment) on Francisco that did it in for them. I still hold dear all the memories of those years’ in the parish as well as the southwest side. Wow, a flash from the past! My big Irish family grew up here. I graduated in 1972. I don’t think I appreciated the beauty of the Church, since I was so young and it was the church I grew up in. I graduated in 1962 with the O’Leary twin sisters, Kathleen and Patricia. Father Auer was always so saintly. Father Bowler was a more worldly priest whose parents bought him a car. I also believe they gave him his camera equipment and he took some awesome photos of the church. Father Hayes, our pastor had hoped to become a monsignor but because Quigley Prep had been built, that monsignorship went to the head of the seminary instead of our pastor. I am from Tommy More. I graduated from there and was married there. It is and will always be a beautiful church. I have great memories of my time at Tommy More! I attended St. Thomas More school, Class of 85. I have never felt closer to God than in that church. Thank for reminding me of all of its facets. 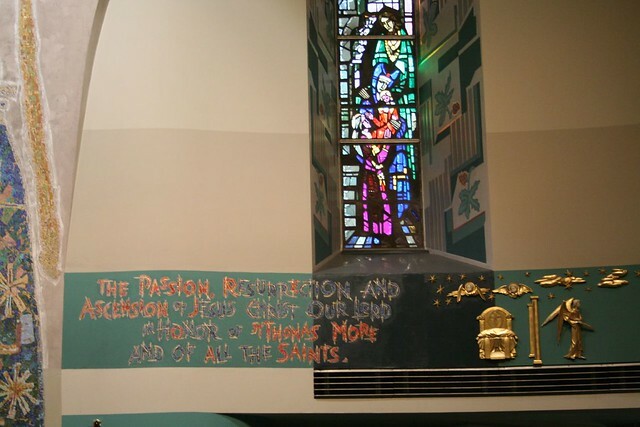 I also have wonderful memories of growing up in St Thomas More Parish. When I think back of that time, I can say it was amazing. Kids today will never have that experience. We all knew each other and had a special connection of that belonging, no matter what age you were. I will always hold those memories close to my heart. Thank you all for that.